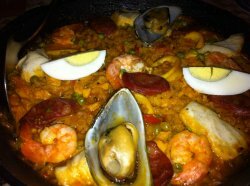 I love tapas so not surprising that I'm trying another tapas place. This time at the happening CQ area. 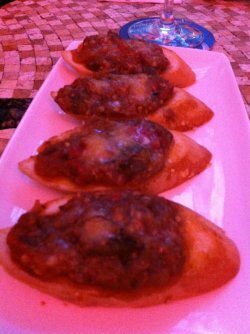 This is the toasted bread topped with peppers, aubergine, onions and Parmesan cheese. This is really a nice vegetarian starter. The mixture is warm and salty and fragrant and really as a finger food while you wait for friends to arrive. 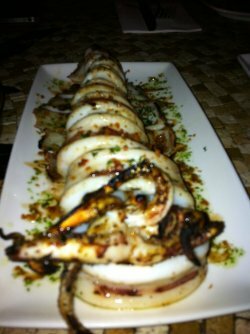 Their grilled squid is not bad, springy and has a lovely smokey flavour. But I much prefer the next squid dish. 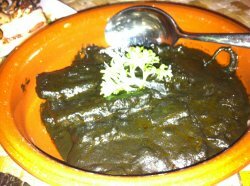 The squid in squid ink is really good! I can't describe how the ink tastes like but it's very very good! Slightly salty, a tang of sweetness poured over fresh squid. Even though the photo looks kinda weird, this is worth a try. 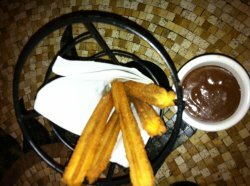 Their churros are a MUST TRY! Crunchy on the outside with a hot soft centre. Dip in sweet and thick melted chocolate, this dessert is damn sinful but who cares! If you gotta sin, go big or go home.